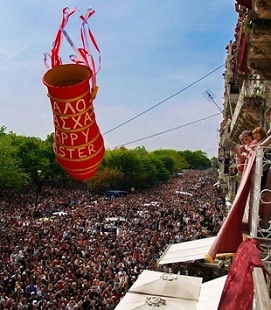 Easter in Greece is the biggest holiday. 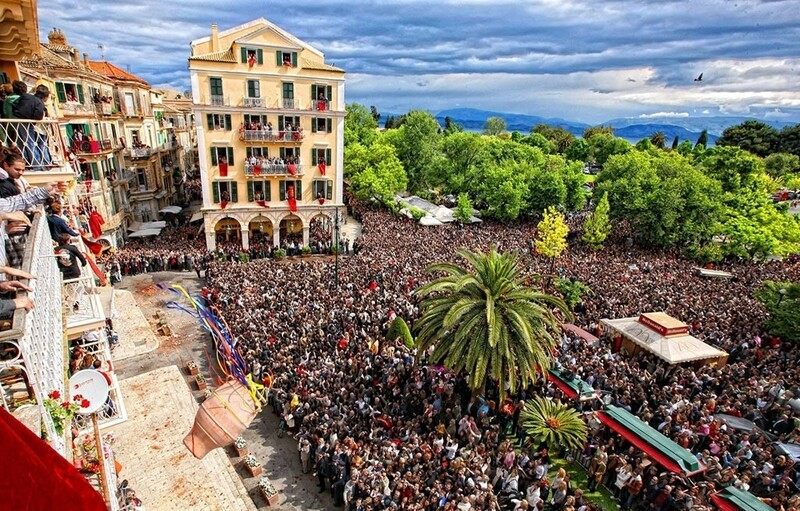 Especially the island of Corfu has become the most popular destination to celebrate Easter for its incredible and very special customs of celebrating the Holy Week . The ceremonies take place in the historical Venetian center of Corfu town, on the main square Spianada, the largest square in whole Balkan and in the plenty of beautiful churches. You can experience an amazing atmosphere on Friday joining the litanies or listening to choruses, bands and famous Philharmonics’ orchestras with 100 members each playing in the city e.g. Verdi's Marcia Funebre and Chopin's Marche Funèbre. On Saturday the first Resurrection is being celebrated at 11 am. by the most traditional way. The building are shrouded in purple and people hurl clay pots from windows and balconies which crash noisily on the streets below. The town is full of music performed by highly awarded Philharmonics as they parade through the streets. At midnight an amazing fireworks light the sky of the square. On Sunday you can see and smell everywhere the hundreds of lamb on the spit , the traditional Greek Easter Sunday lunch and many more local specialties. Don’t miss the chance to experience this fantastic Easter period in Corfu !!! !